Following the ecstatically brilliant “Aura legato” album, Timeau de Liege frees himself from the Af Ursin one-man-quest and teams up with skin mangler and percussive magician Kris Vanderstraeten. Together they are responsible for creating another delicately crafted sound sculptures, filled with a controlled tension and carefully created improvisation balancing on the razor’s edge of fragility and virtuosity. Both of them steer away from easy-going right in your face slabs of free improv power but instead choose to operate on a totally different time frame. This enables them to raise the stakes and augment the challenge that lies buried within these sonic territories. Sonic-wise, if I have to hit you with a comparison, it leans close to early AMM well-balanced free form structures that reveal an almost autistic sense of beauty. 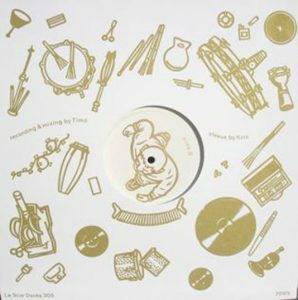 An almost austere listening experience that once again proves that Timo and his La Scie Doree imprint are forces to watch out for. Just sheer brilliant. Comes is silk-screened jacket, limited edition of 350 copies and destined to dry up quickly. Just brilliant stuff. Latest release from Timo van Luyk (In Camera, Af Ursin et al) is another beautifully packaged blat of bewitching low-level drone/improvisation, this time in the company of long-term collaborator Kris Vanderstraeten. 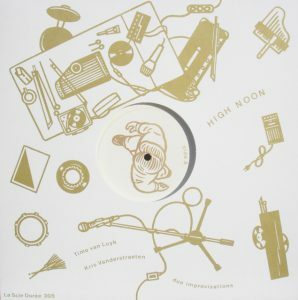 Mostly acoustic, with a heavy percussive element, High Noon touches on a similar kind of tactile low-level free interaction as practiced by Imai-era East Bionic Symphonia, walking the line between more established modes of improvised/psychedelic thought with a rigour and a commitment to the beauty of unadorned form that is truly uncommon. There are repeat-vocal sounds that resemble hypnotised ascetics floating high above the north pole, half-heard nursery rhyme melodies ala Af Ursin and the kind of complex timbral constructs that please the inner eye as much as the outer ear. Totally beautiful, edition of 250 copies on white vinyl with a silkscreened cover by Vanderstraeten and highly recommended.